The FMSCA has been in the hot seat lately for creating an exhibit of photos of persons killed in big truck accidents, but not photos of safe drivers. The ATA and other trucking industry leaders have taken issue with the agency, saying that not only do truck drivers need to be portrayed for the hard work they do to keep the country running, but to have better conditions in which to do their job and better measures for determining unsafe drivers. 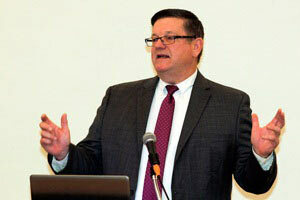 Van Steenberg said the FMCSA is working with ATA to determine ways to recognize carriers who are in alternative safety compliance with safety features such as, speed limiters, crash avoidance systems and seat belts and who implement driver wellness and fatigue management programs. Van Steenberg also stressed that the five agency priorities for the immediate future will be electronic logging devices, the Unified Registration System, carrier safety fitness determination, an inspection modernization system and the next generation of the Compliance, Safety, Accountability program. He explained that the Unified Registration System would work to better enforce the requirement that carriers update information filed with the FMCSA every 24 months.Because many carriers fail to do so and many out of service carriers have been re-emerging under new names, the new system will make it easier for the agency to detect the non-compliance carriers that shouldn’t be out on the road. The FMCSA also proposes to revise the system that determines when a motor carrier is not fit to operate commercial motor vehicles based on (1) the carrier’s performance in relation to five CSA basics); (2) an investigation; or (3) a combination of on-road safety data and investigation information. The revamped program would also benefit truck drivers by eliminating the duplicate charges on a driver’s violation record. Currently, if a driver is stopped for inspection and found to have a tail light out, a headlight out and a failing turn, the driver receives three separate violation listings. Under the new program, the driver would have only one violation listing with all three violations listed on the same listing. “This is something that will be quick win for everyone,” Van Steenberg said.